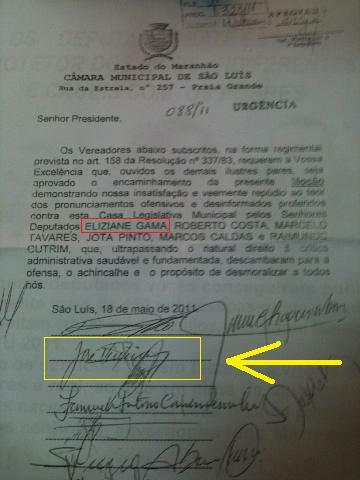 Após ler nos blogs dos jornalistas Gilberto Leda e Marco D’Eça, que a deputada Eliziane Gama (PPS) entrará contra o vereador Vieira Lima (PPS) no Conselho de Ética do PPS, por ele ter assinado uma nota de repudio contra a deputada, vi que os políticos ou são inocentes ou se fazem. Quando foi que um Conselho de Ética de qualquer partido no Brasil agiu contra filiados com mandato? Vão se reunir e colocar panos quentes e tudo termina em pizza. Tem que se acabar com a hipocrisia na política. Basta!!! O certo seria os deputados repudiados e a Assembléia Legislativa, que foi palco de balburdia, divulgar para todos os maranhenses uma nota de repúdio ao ato desses vereadores terem aprovado uma lei baseada em fraudes e no desrespeito ao Legislativo maranhense. Isso seria ético e moral. O resto são coisas de hipócritas!!! Por isso, atrevo-me a fazer essa NOTA DE REPÚDIO A HIPOCRISIA POLITIQUEIRA QUE TOMOU CONTA DO MARANHÃO. Nesta direção teórica, faço valer minha voz nesta nota de repúdio por acreditar que toda forma de autoritarismo, dominação e violação de direitos humanos deve ser denunciada e repudiada publicamente, tal como fez a Assembléia Legislativa. Pauto minha análise e reflexão por ter visto a luta dos deputados para que essa fraude do IPTU fosse indeferida pela Justiça. Acredita-se que a Assembléia Legislativa seja o ambiente adequado para o debate das diversidades existentes. Assuntos que influenciam no cotidiano de todos os maranhenses. Quando uma Instituição limita o diálogo pela arbitrariedade usando como palavra de ordem a “ética”, significa que está é solícita com tudo que lutamos contra o imoral. A nota de repúdio dos vereadores de São Luís é exemplo claro da hipocrisia que ainda domina o meio político maranhense. O grande problema é que os hipócritas politiqueiros só vêem aquilo que convém aos seus interesses. Observam tudo a sua volta, mas esquecem que no “centro” têm humanos que sofreram com suas atitudes irresponsáveis. Para iniciar uma ordem ética e moral nessa hipocrisia politiqueira do Maranhão, seria providencial que o Presidente da Assembléia Legislativa, deputado Arnaldo Melo, e os demais deputados repudiassem em nota o ocorrido na última sexta-feira e sugiro a deputada Eliziane Gama e os demais deputados repudiados, que façam uma contra-nota de repúdio, cujo teor deva constar que eles (deputados) foram repudiados por lutar pelos direitos do povo e que os vereadores estão sendo repudiados por terem aprovado uma lei fraudulenta que saqueia o contribuinte. Useful notions going to use these tonight. In light of CBS’s 60 minutes episode one can’t help but conclude Armstrong is doing the perp walk soon. Thank you for the entry, I don’t agree completely with it but I agree with it on the most part and I definitely applaud your effort in putting it so ably. I can’t help but think that this wedding will be one of the greatest things to happen of the recent years. Best wishes to the happy newlyweds and any one that doesn’t agree is a misery. Thank you for today’s entry, I don’t quite agree exactly with it but I agree with it on the most part and I definitely applaud your effort in putting it so clearly. I definitely respect this post! Grazie for this entry, honestly, can you sign up as a writer for wikipedia because the current entries in there for our interest is quite frankly garbage. I don’t quite agree exactly with it but I agree with it on the most part and I certainly applaud your effort in putting it so succinctly. I am over the moon about it and I think that this wedding is one of the greatest things to happen of the recent years. Felicitations to the happy newlyweds and any one that doesn’t agree is a killjoy. I def dig this post! I def like the sentiment! Gracias for today’s post, honestly, can you sign up as a author for wikipedia because the current stuff in there for our interest is quite frankly drivel. I don’t quite agree completely with it but I agree with it on the most part and I certainly applaud your effort in putting it so ably. Ever since that episode of 60 Minutes you have to think Lance Armstrong is going to struggle. Many thanks for your post, I don’t agree exactly with it but I agree with it on the most part and I wholeheartedly applaud your effort in putting it so succinctly. Thank you for this entry, I can’t say I agree exactly with it but I agree with it on the most part and I wholeheartedly applaud your effort in putting it so succinctly. I think that this wedding will be one of the best things to happen of the recent years. Best wishes to the happy couple and any one that doesn’t agree is a stick in the mud. Many thanks for today’s post, I don’t agree completely with it but I agree with it on the most part and I certainly applaud your effort in putting it so succinctly. Now I’ve seen that Sixty Minutes program I would be sure Lance is done for. Exceptional piece,I think you could have for sure established a web page I wish to visit on the regular basis. Thanks. Now I’ve seen the 60 Minutes Program you have to conclude Armstrong is doing the perp walk soon. Extraordinary piece of writing,It is my opinion you could have probably got a website I would like to read more often. Thanks. Many thanks for this entry, I don’t quite agree completely with it but I agree with it on the most part and I certainly applaud your effort in putting it so clearly. I am over the moon about it and I think that this wedding will be one of the greatest things to happen of the 2000s. Congratulations to the happy newlyweds and any body that doesn’t agree is a stick in the mud. Since watching that 60 Minutes Program one can’t help but reckon Lance Armstrong is going down. I really agree with the sentiment. Grazie for the entry, seriously, can you become a contributor for wikipedia because the current entries hosted there for our hobby is frankly next to useless. I can’t say I agree completely with it but I agree with it on the most part and I wholeheartedly applaud your effort in putting it so clearly. Great feature, I actually enjoyed studying it, keep doing the good efforts. Grazie for today’s post, honestly, can you sign up as a topic author for wikipedia because the current pages hosted there for our interest is quite frankly garbage. I can’t say I agree exactly with it but I agree with it on the most part and I certainly applaud your effort in putting it so ably. Enjoyable post, I genuinely had a good time reading it, keep up all the hard work. There’s no doubt that this wedding will be one of the best things to happen of the decade. Best wishes to the happy newlyweds and any one that doesn’t agree is a stick in the mud. Fun feature, I actually enjoyed glossing over it, keep doing all the good writing. Thank you for the entry, honestly, can you become a writer for wikipedia because the current pages hosted there for our hobby is quite frankly dross. I can’t say I agree exactly with it but I agree with it on the most part and I definitely applaud your effort in putting it so ably. Fantastic message,In my opinion you have without a doubt started a website I would like to read up on routinely. Thanks. Really good contribution,I believe you could have unquestionably got a blog I have to return to routinely. Thank you. Many thanks for today’s post, I can’t say I agree completely with it but I agree with it on the most part and I wholeheartedly applaud your effort in putting it so clearly. I most certainly reddit your views.